Fall in love with the delicious flavor of the limited edition Formula 1 Caramel Apple! With the ideal balance of protein and nutrition and a crisp, sweet flavor, this shake will satisfy your hunger all while keeping your weight-management program on track. Indulge in this new seasonal flavor while supplies last! Protein is vital to a healthy diet, as it’s one of the essential building blocks for many cell components in your body. Protein helps satisfy hunger, build muscle tissue, maintain lean muscle mass and give you energy. And when you consume 25 g of soy protein a day, as part of a diet low in saturated fat and cholesterol, you may reduce the risk of heart disease. 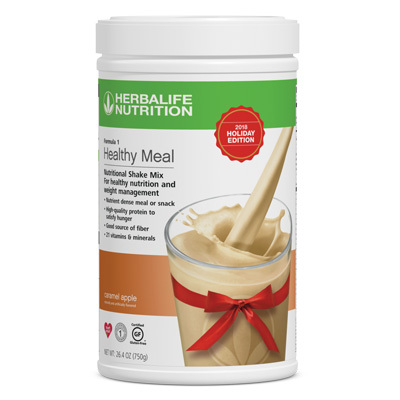 One serving of Formula 1 provides 9 g of soy protein. Clinical studies on U.S. Formula 1 (one study) and on similar products show that Formula 1 shakes taken twice a day as part of a reduced-calorie diet along with moderate exercise help people lose weight. Blend or stir 2 scoops with 8 fl. oz. of nonfat milk or soy milk and enjoy! *When prepared with 8 fl. oz. of nonfat milk or one serving (2 scoops) of Protein Drink Mix.